I was sucked into Teaming with Microbes by Jeff Lowenfels and Wayne Lewis this weekend. Teaming with Microbes took the information from my Living Soil lunchtime series and turned it into what felt like a fast-paced action novel, complete with stunning photos of the characters. As you probably remember, a healthy soil food web equates to a healthy organic garden. If you have the right critters in your soil, you'll have better nutrient retention, better soil structure, and better defense against diseases. 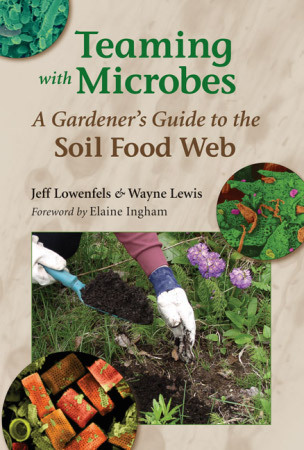 But Lowenfels and Lewis took the story one step further, explaining that not every soil food web is created equally. Nor will one type of food web make all plants happy. The key is to come up with the right fungi to bacteria ratio for each garden. Looking for a gift for the homesteader on your list? Our automatic chicken waterers keep water poop-free! It was one of the top books I read in 2009! So glad to "meet" you in person!